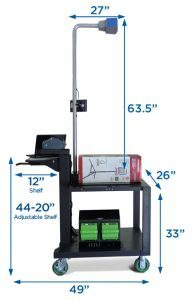 SMG3 is happy to announce Newcastle Systems’ QubeVu, paired with the new Atlas Series Mobile Dimensioning Station, the rugged Atlas Series Dimstations are available in 30″ and 48″ long workstations. 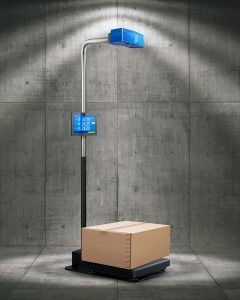 The QubeVu is the economic solution, offering the world?s fastest dimensioning with certified accuracy on all shapes, and finally class-leading simplicity. The QubeVu offers seamless scanning with an automatic scanning feature that does not require object alignment, place the item on the scanning surface and allow the QubeVu to instantly measure the dimension of the item. During scanning the QubeVu also takes a photo of every item that is measured and is extremely simple to setup. *Please refer to the Video and Whitepapers below for more information. 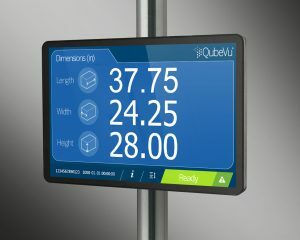 View the dimensions of the items instantly on the QubeVu screen provided with the QubeVu DimStation. Learn the length, width, and height of the item in an instant. All shapes and most sizes supported by the QubeVu Dimstation. Simply place the item on the Dimstation and watch as it measures the shape’s dimensions. DimStation is a freestanding unit with integrated display. This is the complete solution for retail and industrial settings. Offers instant dimensioning of any object in any orientation – cubes, tubes, polybags and irregular shapes. 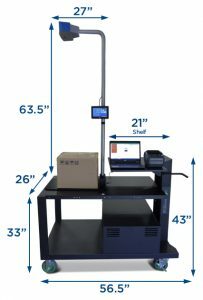 The New Atlas Series Mobile DimStation provides a large workstation for quick and accurate dimensioning of your product. Increase productivity up to 50% and lower costs. Available with optional top shelf. The New Atlas Series Mobile DimStation provides a compact workstation for quick and accurate dimensioning of your product. Increase productivity up to 50% and lower costs. Available with optional top shelf.